England's Danny Rose has told the BBC that his teammates were "over the moon" to see Raheem Sterling criticise the media's coverage of black players saying he was "spot on". 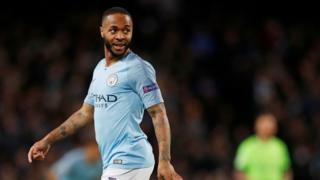 Sterling, who plays for Manchester City, was allegedly racially abused by a Chelsea fan during a Premier League match in December 2018. After the incident, Sterling posted on his Instagram saying that British newspapers help 'fuel racism' by the way they portray black footballers. "Raheem was only saying what we all say in the dressing room," said Danny Rose, who is Sterling's England teammate. What did Danny Rose say about Raheem Sterling? Rose was speaking ahead of England's European Championship qualifier against the Czech Republic on Friday. When asked about Sterling's view on the media's portrayal of black players, Rose said: "It's sad really but he's 100% spot on with what he said." "The stick he used to get from the media was bang out of order. When he put the [Instagram] post up about the media we were all over the moon with that because we all agree. Fair play to Raheem. "Now it's not just boys in the dressing room talking about the media targeting Raheem, the general public have now seen it." Why are people talking about racism in football? What did Raheem Sterling's Instagram post say? Raheem Sterling has been the subject of a lot of tabloid newspaper stories away from the football pitch. 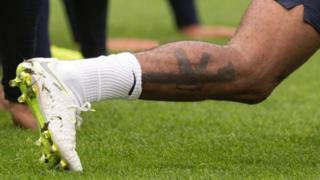 In May 2018, he was criticised for getting a gun tattoo on his leg. Sterling claimed the tattoo was in memory of his father, who was a gun violence victim. 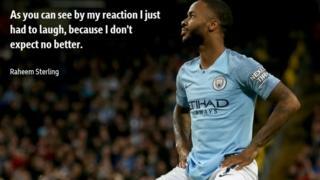 Sterling rarely gives media interviews but directed a post to the British tabloids after he suffered alleged racial abuse during a match in December. He pointed out the differences in tabloid reporting of how black and white players spend their wages. Sterling posted two pictures showing headlines from the Daily Mail newspaper. One talked about a young black player, Tosin Adarabioyo, spending millions of pounds buying a house, while the other headline talked about a young white footballer, Phil Foden buying his mum a home. In fact, both players were buying homes for their mothers. The point that Sterling was making was that the young white players are shown in a more positive way than young black players. Raheem Sterling's alleged racial abuse is just one of the high profile incidents involving racism in football in the past year. On 14 March, for example, Sterling's England teammate, Callum Hudson-Odoi, suffered alleged racial abuse during a match for Chelsea against Dynamo Kiev in the Ukraine. Just under a week later, on 20 March, Sheffield United women's player Sophie Jones was sacked after being found guilty of racially abusing Tottenham player Renee Hector. Kick It Out - a football equality charity - publishes statistics every year looking at the number of people who have reported a case of unfair treatment at all levels of football. Last year, there were 520 incidents, up from 469 the year before. Over 50% of these were cases of racism. However, it's impossible to know if this is because there's been a rise in racism or simply a rise in people being confident to report racism. Speaking to Newsround in December 2018, England's first ever black footballer, Viv Anderson, said "nothing has changed in 20 years" for black and ethnic managers hoping to coach in the Premier League. "Something has to change because I think we've only got two or three black managers in the Football League," said the 62-year-old. "Black, Asian, it doesn't matter. As long as they've got the qualifications I think they should be given an opportunity." What was the Race Relations Act? Racism: What would you do if you ever saw it happening?